This post contains amazon affiliate links which means that if you make a purchase after clicking one of those links, I will make a small commission. I am not very familiar with a traditional bread or cornbread stuffing. It’s not something I grew up eating. It’s not even something I knew existed until I moved to Canada. My knowledge of bread stuffing is limited by the stuffing served for a Festive Special at our local Roasted Chicken place (Swiss Chalet) and the boxed stuff that my in-laws make for Christmas. Both versions taste the same so I suspect that the restaurant gets theirs from the box also. 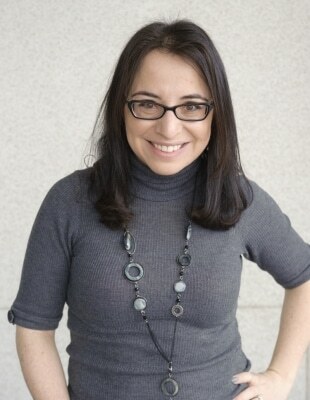 I love that stuffing – it’s soft and moist and sort of all mushy. Yet, it’s so particular that I usually eat it only a couple of times and am happy to wait a year before having it again. Stuffing that my family actually used for our own Thanksgiving or Christmas Turkey was mostly made of fruits and nuts. I even have a variation of that recipe in my cookbook. 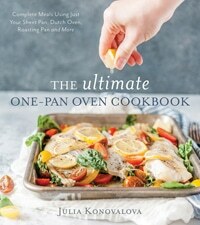 If you love chicken with fruit, then you should try my Roast Chicken stuffed with Dried Fruit from The Ultimate One-Pan Oven Cookbook. It’s delicious!! 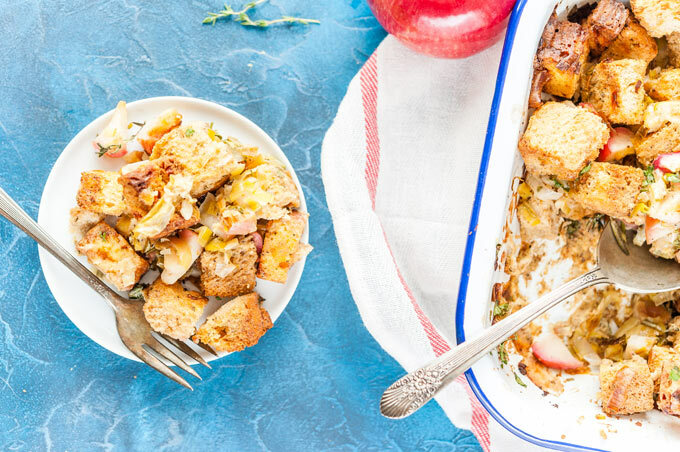 So, for this Cornbread and Apple Stuffing, I combined those two very different versions. I used a mixture of bread and cornbread together with the fruit. In this case, I used delicious local Cortland apples sautéed with leeks. As I said, I am not a stuffing expert, so I played by ear when developing this recipe. It is not soft and moist but it’s on purpose. This recipe is great for managing food waste as you don’t even need to buy a lot of expensive ingredients. Use some leftover bread, you don’t need a lot, so don’t buy a whole loaf, just take a few slices of any white bread you have. Cornbread is a great side for any family meal, including Thanksgiving or Christmas dinners, so make a big batch and use a little bit to make the stuffing. No need to waste the rest of the cornbread. 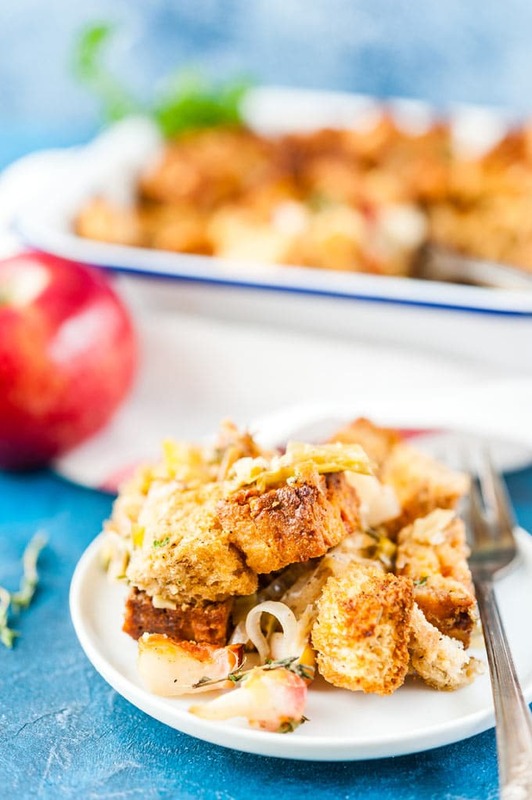 I love using local apples for this Cornbread and Apple Stuffing because although apples are season-less, they are particularly great in the fall and early winter right after harvest. Apples are also very affordable. 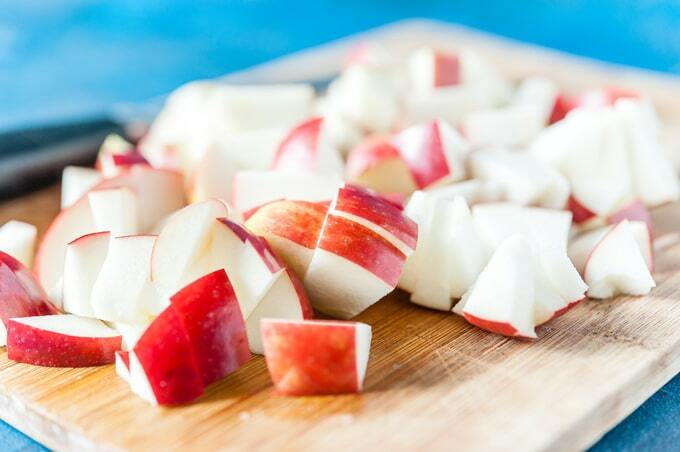 Apples are great for snacks and desserts, so most likely you will have no food wasted when buying a bag of apples. FUN FACT: I recently visited Algoma Orchards and their apple sorting facility. It turned out that most apples that are sold in bags, are not covered in food-safe edible wax. That wax coating is usually added to the apples sold individually. It is not difficult to make Cornbread and Apple Stuffing but it requires a few steps. 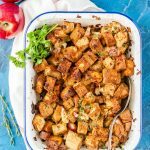 I tried making this bread stuffing with omitting a step or two and although the flavour was great, the texture wasn’t as good. 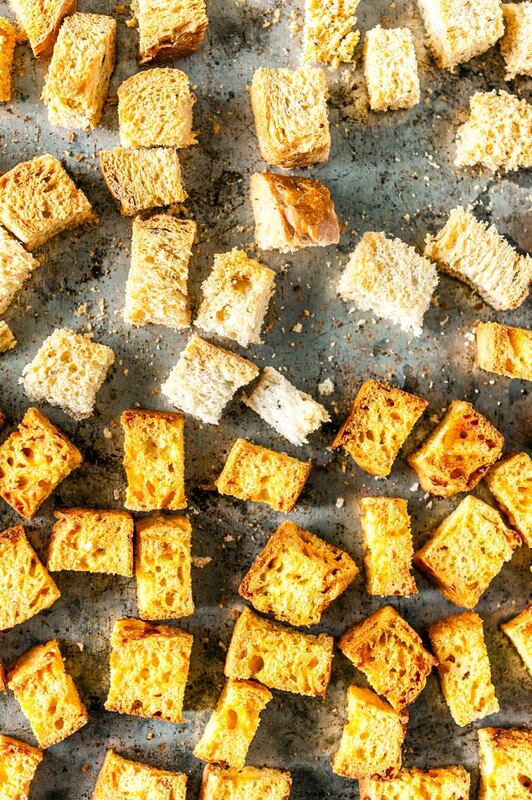 Cut the bread and cornbread into cubes and toast them in the oven. 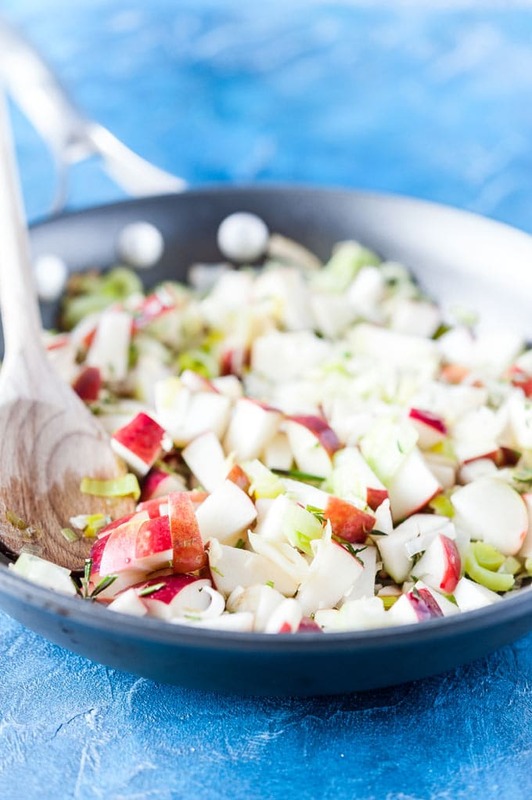 Sauté apples and leeks until softened. 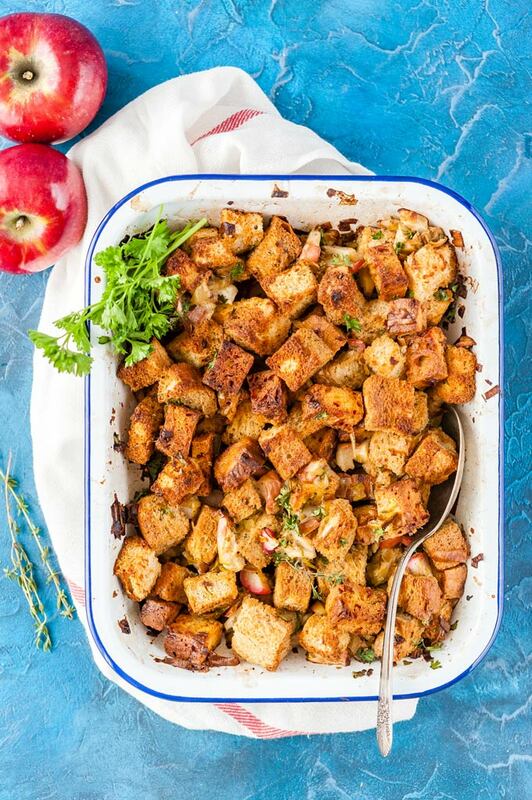 Mix the toasted croutons, cooked apples and leeks with broth, eggs, and spices. As I mentioned earlier, I prefer the stuffing that is crispier and is in pieces (croutons). I think it pairs well with gravy and other sides. 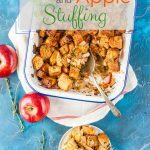 The bottom layer of this Cornbread and Apple Stuffing is soft and moist, while the top layer has crisp and crunchy seasoned croutons. Increase the amount of broth. Add about 1/4-1/2 cup more. Use a bigger roasting pan as that would mean that the bread is spread out more and is more evenly covered in broth. OR, let the mixture stand for 10-15 minutes before baking, mixing a few times, so that the croutons soak up the broth. Or use Applesauce Cornbread from my cookbook, The Ultimate One-Pan Oven Cookbook. You can see an adaptation of that recipe on my friend’s, The Busy Baker, site. I tried this Cornbread and Apple Stuffing with local Gala apples and local Cortland apples. Both tasted delicious! Use your favourite local firm apples. You want them to stay in pieces. Here’s a handy-dandy Apple Usage Guide. I love using leeks, they add a mild flavour. You can use regular onion, or sweet onion, or shallots instead. I know most traditional bread stuffings use sage but I decided to go with the savoury flavours of thyme and rosemary. Use your favourite herbs that you like in stuffing instead. I use fresh parsley but you can use dried parsley instead (2 teaspoons), just make sure that it’s actually dried parsley and not dry mint as I made that mistake once and believe me, mint does not go well with this stuffing at all! I went with just classic and simple salt, pepper, and garlic powder. Feel free to use your favourite seasonings: onion powder, paprika, chili powder, cayenne pepper etc. Use either vegetarian or chicken broth. Add 1/4-1/2 cup more for softer and more moist stuffing. 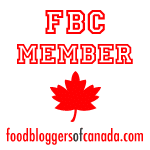 I use 11×9″ (2 litres volume) pan for this stuffing. 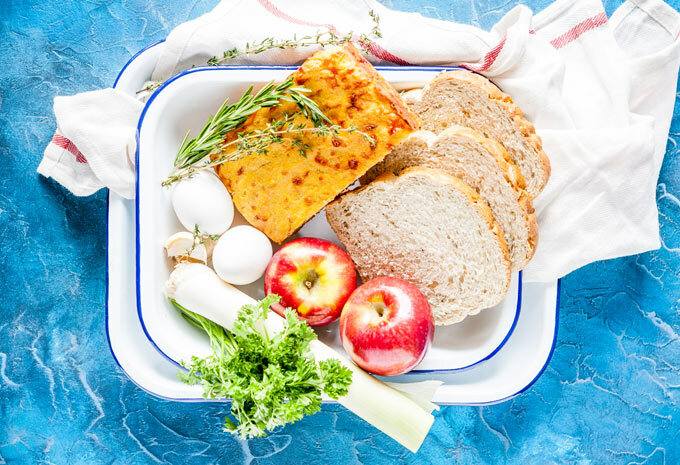 The bread and cornbread cubes are not in single layer, so the bottom layer is soft and moist and the top layer is crispy. Use a bigger pan so that all the bread is in single layer for a stuffing that is more consistently soaked in broth and softer. You might also need to bake it for less time. Spread the cubed Italian bread and cornbread into an even layer on a large sheet pan. Toast in the oven for about 30 minutes. Meanwhile, core and chop the apples into 1/4 inch pieces. Discard the green leek leaves. Slice the remaining white and light green part of the leek in half lengthwise and wash very thoroughly between the layers. This is where specs of dirt often hide so make sure to get everything out. Remove the leaves from the rosemary sprig and roughly chop them. Remove the leaves from the thyme sprigs. Very finely mince the garlic. In a medium skillet, melt the better together with the olive oil on medium heat. Add the chopped apples, sliced leeks, thyme leaves, and chopped rosemary leaves and sauté mixing occasionally until softened. About 7-10 minutes. Add the minced garlic and cook for another 1-2 minutes until fragrant. Set aside. In a medium bowl (or a measuring jug), whisk together the eggs, broth, and seasonings. 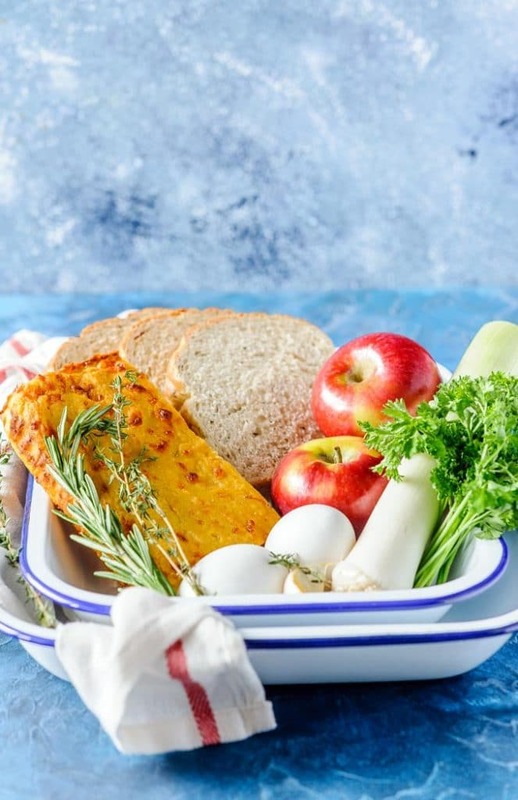 In a large bowl, mix together the toasted bread and cornbread with the cooked apples and leeks, chopped parsley and the egg-broth mixture. Alternatively, you can do that step directly in the roasting pan. Pour the stuffing mixture into the 11x9" roasting pan and spread evenly. 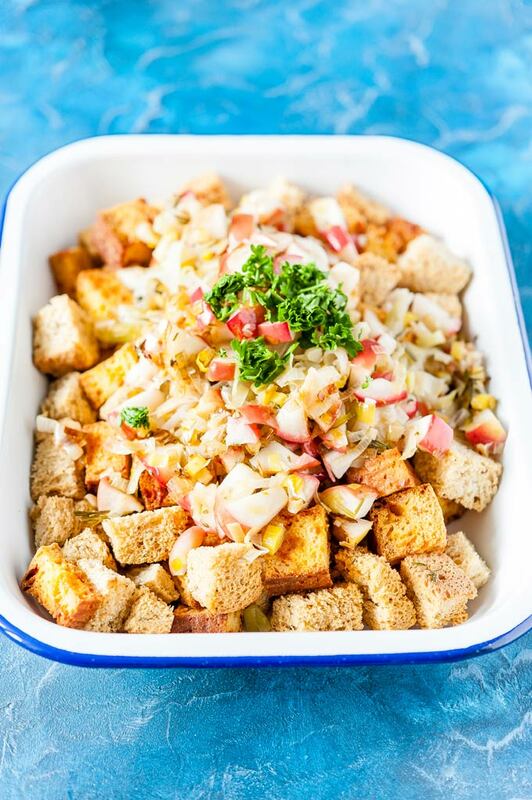 Let the stuffing mixture sit in a bowl for 10-15 minutes and mix it once in a while so that all the croutons soak up the moisture. Use a bigger pan so that all the croutons are in one layer and are evenly covered in eggy-broth mixture.